Why did Kenya invade Somalia? Editor's Note: Critical Questions is produced by the Center for Strategic and International Studies (CSIS). Richard Downie is a fellow and deputy director of the Africa Program at the Center for Strategic and International Studies in Washington, D.C. The views expressed in this piece are solely those of Richard Downie. Kenya is in the third week of a major military offensive inside neighboring Somalia. Called “Operation Protect the Nation,” it is Kenya’s largest military operation since independence in 1963. Around 1,600 troops are sweeping through areas of Southern Somalia controlled by the extremist Islamist group, al Shabaab. The Kenyan air force has also been in action, launching bombing raids on insurgent bases. Kenya’s military spokesman has even used his twitter account to warn residents living near al Shabaab camps in 10 towns to take shelter against imminent attacks. Q: Why did Kenya invade? Richard Downie: Kenyans have gotten increasingly alarmed about Somalia’s chronic instability, which has spilled over its borders. One manifestation of this instability is Dadaab refugee camp in northeastern Kenya, which receives Somalis fleeing the humanitarian crisis in their own country. Numbers at this camp have swelled to almost 450,000 because of the famine conditions in parts of Southern Somalia. 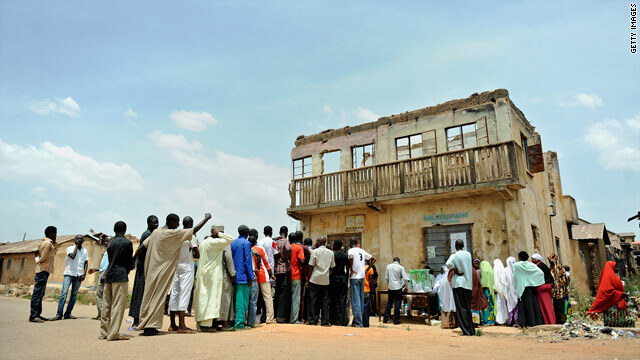 Nigerians queue to vote at a polling station on April 16, 2011 in Nigeria's Central Belt Jos' Du area during the Presidential elections. Editor's Note: Richard Downie is the Deputy Director of the Africa Program at the Center for Strategic and International Studies. The final votes are still being tallied but already it would appear that Nigeria has held the most credible presidential election in its history. The contrast between the debacle of 2007 and the relatively orderly process which unfolded in 2011 could not be sharper. Then, even the winning candidate, Umaru Yar’Adua, was embarrassed by the blatant levels of corruption, intimidation, and voter fraud which propelled him to office. This time round, Africa’s largest democracy has begun to restore its battered reputation. The protracted election crisis in Ivory Coast has taken a decisive turn. Armed forces professing loyalty to the winner of November’s presidential election, Alassane Ouattara, made their move following months of deadlock caused by the incumbent Laurent Gbagbo’s refusal to leave office. Christened the Republican Forces of Ivory Coast (FRCI) by Ouattara, they swept south from their northern base, capturing most of the country in a matter of days. The offensive did not meet serious resistance until it reached Ivory Coast’s largest city, Abidjan, a stronghold of Gbagbo support. Heavy fighting took place over five days between the FRCI and Gbagbo’s presidential guard and youth militia. Gbagbo’s resistance finally cracked on April 5, when his presidential palace was overrun. He is now thought to be negotiating the terms of his surrender.